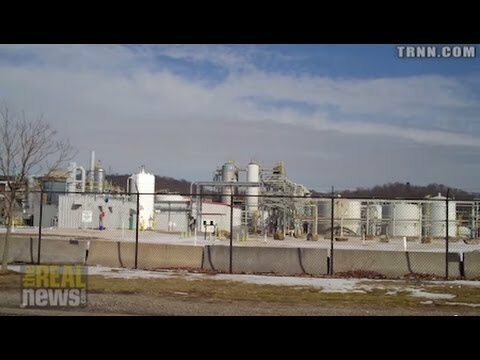 July 9 marks the six-month anniversary of the chemical spill in West Virginia caused by leaking tanks belonging to mining chemicals supply company Freedom Industries. The disaster affected 300,000 people and the story reached national and international news. Freedom Industries was also recently find $11,000 by the Labor Department’s Occupation, Safety, and Health Administration for the spill. Here to bring us up to date on the situation in the ground in West Virginia we have two guests. Russell Mokhiber is the editor of the Washington, D.C., based Corporate Crime Reporter, and he’s also the founder of SinglePayerAction.org. And he also lives in West Virginia. We’re also joined by Angie Rosser, the executive director of the West Virginia Rivers Coalition. RUSSELL MOKHIBER, EDITOR, CORPORATE CRIME REPORTER: Thank you. ANGIE ROSSER, EXEC. DIR., WEST VIRGINIA RIVERS COALITION: Thanks for having us, Anton. WORONCZUK: So, Angie, let’s start with you. On January 9, 2014, it was revealed that up to 7,500 gallons of a poisonous chemical used in the coal washing process spilled into West Virginia’s Elk River, which is the sole water supply for the city of Charleston and population in parts of nine different counties. Bring us up to date. Is the water considered safe to drink now? ROSSER: Well, we’re being told it is safe, and we’re also being told to use your own judgment and discretion on if the official word is enough to have you feel okay drinking it. I can tell you that most people are not drinking it. The last survey that was released from our local health department and the CDC shows that about 30, 36 percent, so about a third of the people are now starting to drink the water again. But I’ve talked to parents who are still bathing their children in bottled water six months after the fact. And the question is: how long will we continue to live this way? WORONCZUK: Okay. And, Russell, part of the story that came out was that the last state inspection of Freedom Industries’ processing plant was in 1991. Can you give us a bit of the background around deregulation of the mining and coal-related industries West Virginia? And what has happened to Freedom Industries since? MOKHIBER: Well, just yesterday, as you mentioned, Anton, Freedom Industries was fined $11,000 by OSHA. There’s an ongoing criminal investigation by the U.S. attorney. But the reality is–and income will be–my prediction is this company and/or executives, or both, will be criminally prosecuted. There will be a prosecution for what happened here, because this is a relatively small company, not well politically connected. But the reality is it’s a broader issue than that. Both–the whole political infrastructure in the state has been captured by the coal, chemical, fracking industries. For example, it’s rare to find a politician who will stand up against mountaintop removal, which is destroying the mountains in southern West Virginia and making the people ill with birth defects and cancers and other illnesses. And I haven’t heard–maybe Angie’s heard–I don’t hear any politician in the state speaking out against that. So there was real anger when this happened, when the spill happened, but it’s been subsiding. I mean, people were marching on the water company with their bills saying, you know, we don’t owe you, you owe us, but that really has subsided. There is a push in the political realm to put independents on the ballot to push back against both political parties, which are captured. One example is here in the 2nd Congressional District, which includes Charleston. People have been petitioning to put an independent, former CBS newsman Ed Rabel, on the ballot, who wants a moratorium on mountaintop removal, who wants to get money out of politics, who wants a moratorium on hydraulic fracturing in the state. Both of their candidates–the Democrat is a, you know, former lobbyist for the Chamber of Commerce; the Republican is a carpetbagger corporate candidate. Both are, you know, say nothing about the corporate power issues facing this state. So I think there’s real hope in the political realm. There are independence running for the West Virginia House of Delegates who want to stand up to the industries. And I think that’s where the hope lies. There will be legal action. There are lawsuits against Freedom Industries and related companies. There is this ongoing–as we mentioned, ongoing criminal investigation, which probably will result in a prosecution, you know, these minor slap-on-the-wrist fines coming down. But that’s not what’s going to make a difference. We have to relieve ourselves of the power grip on the political structure that the corporations have. And the way to do that is through the political process. And that’s what’s happening. WORONCZUK: And, Angie, what was the political response of the community to the spill? Did we see any organized grassroots campaigns or citizens groups come out of this crisis? ROSSER: Absolutely. It was quite amazing, something we hadn’t seen before. And I think the initial response of our political leaders was to place the blame totally on freedom industries as one, as a single bad actor. And what we knew is that this was more about a broader systemic issues of lax regulation in our state and favoring industry interests over the public interest and public health. And I think for the first time many people first of all started thinking about where their drinking water comes from and making the connection between environmental protection and regulation and their own public health. So there was that. And then there was the recognition that, you know, we have endured a lot in West Virginia and have suffered a lot as people in terms of public health, in terms of economic cost, [at the favor?] of big industry. And to see people organize organically and spontaneously and respond to this crisis–as Russell mentioned, there was a lot of outrage, and it was that anger at first that motivated people to get involved in the political process. And it paid off. We saw probably the most significant water protection bill–it passed our legislature unanimously just a few months ago. So we did see a shift in power, I think. The bigger and maybe more significant question is: how long will that last? Will we fall back into complacency as citizens? Or will we realize that this was the wakeup call that we actually have to take action in holding government and industry accountable and not just assume that everyone’s doing the right thing? WORONCZUK: Russell, have we seen any changes around the regulation of the coal industry since the spill in January? MOKHIBER: Well, this was related to the coal industry. This chemical that was spilled was used to treat coal. But as for the coal industry, I don’t think there’s been–there hasn’t been much progress. You know, pretty much, again, as I mentioned, you see very few politicians if any speaking out, except for the independents, speaking out for more regulation. What you hear mostly is this–Obama’s wan on coal. So, no, I would say there has not been significant progress. Let’s take the U.S. Senate race for an example. You know, it’s Capito, Congresswoman Capito, who’s running for the Senate race, a Republican, against Natalie Tennant, the secretary of state. And, you know, Natalie Tennant’s ten points behind. My view is the reason is because she refuses to stand with the people of West Virginia and with our natural resources against the coal industry, which is hurting them. And so, you know, she was actually–came to Berkeley Springs a couple of weeks ago, and myself and some friends went to this event that she was having. We asked her about why doesn’t she favor a moratorium on mountaintop removal, which is making the people of Southern West Virginia sick and which is destroying the streams that she worked so hard to protect? And she said, hold on one second, got her press person, and ran away. You know. And Elizabeth Warren is coming to the Eastern Panhandle next–Senator Elizabeth Warren is coming to support her candidacy next week, but little does Elizabeth Warren know–or maybe she does–that, you know, Natalie Tennant is trying to out-Capito Capito here on coal. And it’s not working, because, you know, people are starting to get a clue about it. And, you know, so that’s why I think–like, in the Rabel campaign in the 2nd Congressional District, the first poll that came out road showed Rabel at 10 percent, and nobody knows who he is. It’s only because he’s an independent, and people say, we know our system is corrupt–a pox on both your houses. We need to do something new. And, you know, I think that’s what’s starting to happen. It’s a result of the spilled. People are frustrated with the two-party system, with the gridlock here in West Virginia, and they want to break out. They just don’t know how to do it. WORONCZUK: Okay. And let me pose this final question to both of you: what would you say to those who would argue that more regulations hamper the growth of industry and much-needed jobs and that accidents are just a part of doing business? Angie, let’s start with you. ROSSER: Well, you know, what’s been interesting in Charleston is that part of the outbrage has been among the small business community. So if you ask a small business owner about the cost of not regulating and not protecting our water, they will say it cost them business. I mean, it shut our whole capital city down for days. And still were repairing economically, and I don’t know if we’ll ever get back to restoring our reputation as a safe place to drink water and come visit and enjoy. So it’s a matter of perspective. And what I’m hearing from a–new rhetoric, among especially small business owners, is that they’re tired of paying the cost for big business benefits. So it’ll be interesting to see how this dynamic plays out as people are starting to realize that even though our politicians pretend that coal is the biggest issue, it really only supports 3 percent of our workforce in West Virginia. So we have to, I think, get a reality check not only about the current situation, but also the future of fossil fuel extraction, and we’ve got to start being more innovative if we’re going to thrive as a state. WORONCZUK: And, Russell, let’s get your response to the same question. MOKHIBER: Well, it’s deregulation that’s costing the state, not regulation, because, as Angie said, you know, people all around the country notice what happened here in West Virginia, and people don’t want to live in an area where the water’s polluted and when people are getting sick. We pledge of allegiance, and when we pledge of allegiance, it’s with liberty–it’s not just with liberty; it’s with liberty and justice. And justice means law and order. It also means law and order and enforcement for corporate crime and wrongdoing. So with liberty and justice for all, not just liberty, and we have to bring justice back into the equation here in West Virginia. WORONCZUK: Okay. Russell Mokhiber and Angie Rosser, thank you both for joining us.